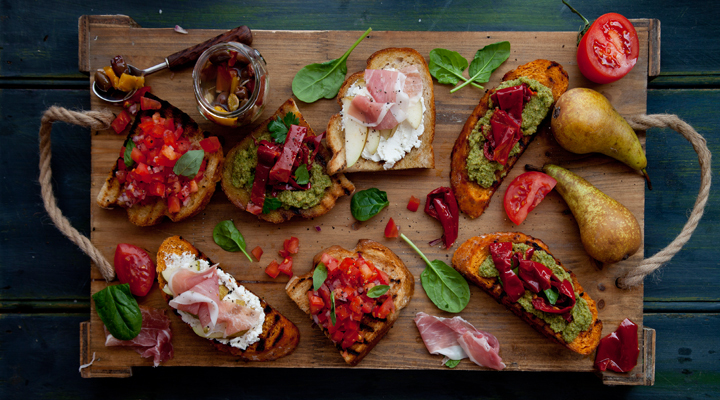 Bruschetta are a great way to start a meal and a fun way to experiment with all kind of toppings. These three variations are a perfect example of their versatility. Prepare a variety of toppings and let everyone help themselves. Toast the bread on both sides under the grill or on a non-stick pan until golden, then lightly rub with the cut garlic clove. Make sure the bread is hot before adding the topping, as the heat will enhance the flavours. To make the tomato and basil topping, place the tomatoes, red onion and oregano in a bowl. Add a small dash of oil, season with salt and pepper and stir. Allow to rest for a few minutes so all the ingredients marry together. Just before serving, tear the fresh basil leaves and stir them into the mix, then spoon the topping onto the toasted bread. You must eat this bruschetta right away after adding the topping or the tomato juices will soak the bread and ruin its crunchy qualities. To make the Parma ham topping, first make the balsamic reduction. This will make plenty of reduction but it can be kept in the fridge for a good while. Place the sugar and vinegar in a small pan and gently simmer on a low heat, stirring until the sugar has dissolved and the vinegar has thickened. Let it cool down and pour into a squeezy bottle. Spread most of the ricotta on the toasted bread, then add enough pear slices to almost cover the bread. Add another little bit of ricotta to the pear (the ricotta will act like glue to keep all the ingredients on the bread), then add half a slice of Parma ham. Drizzle with a little balsamic reduction and serve. To make the green olive tapenade, drain the olives and place them in a food processor with the parsley, a little oil and some salt and pepper. Blend until smooth, adding a little more oil if needed. Spread the tapenade on the toasted bread and add strips of the roasted red peppers. Garnish with some parsley, either chopped or whole.